DigiWall is assembled from several wall modules. The standard version consists of 6 wall modules and a selector module were game, language and level are selected. It is 6.5 meter long and 2.8 meter high. It requires minimal space, since the wall sections are normally mounted on a framework that is built on the existing wall or in a corner. It is also possible to build freestanding units and custom-adapted walls. 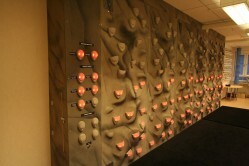 The wall sections are fitted with specially made climbing grips that contain sensors and light diodes. In addition to the wall sections and climbing grips, DigiWall also has a computer that communicates with the grips, processes the signals and drives a high-end surround-sound system. The system’s software runs on a standard computer, which makes it easy to upgrade and add new games. DigiWall was originally created by the Interactive Institute’s research studio Sonic, in Piteå, Sweden. Sonic researches and develops technologies for audio and music applications for digital media. The concept has been further developed and is today marketed and sold by the spin-off company Digiwall Technology AB. DigiWall® is a registered trademark and the product is patented.